The West Hollywood City Council formally abandoned even the pretense of representing taxpayers when it recently voted 4-1 to “add a student loan forgiveness program” to the list of benefits available to WeHo city employees. Kudos to Ms. Meister for her willingness to put residents ahead of the city’s most powerful special-interest group. In an excellent op-ed penned after the proposal was first announced, area resident Alan Strasburg questioned why the council felt the need to further inflate city workers’ compensation packages, which were already among the richest in the area. Strasburg observed that the median earnings for WeHo city government workers were above those in comparable cities, while city executives earned some of the highest base salaries in the state — with the WeHo’s director of communications making more than her counterpart in the White House! A review of compensation for other city employees reveals that the excess extends beyond just top executives. The Bureau of Labor Statistics reports average wage data by occupation and region, making it is possible to compare the compensation received by certain WeHo city workers to the market as a whole, not merely other governments. 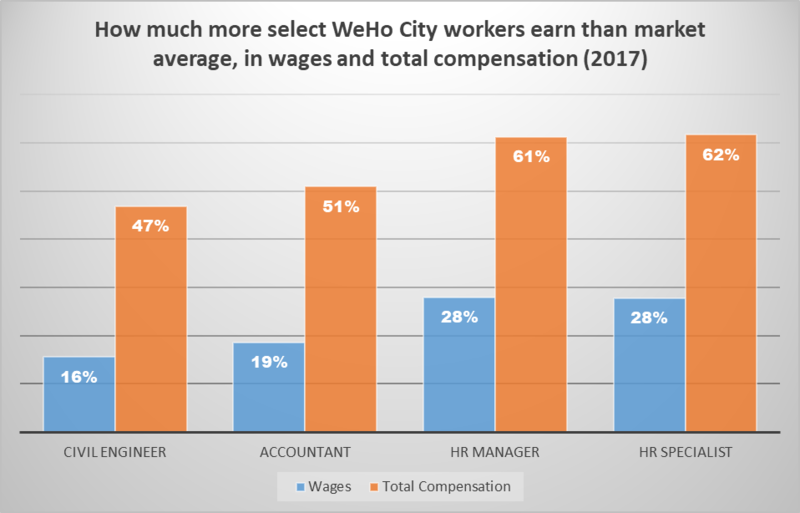 The BLS wage data for the greater LA-areahad four occupations that matched perfectly with the job classifications of WeHo city workers: Accountants, Civil Engineers, HR Specialists, and HR Managers. 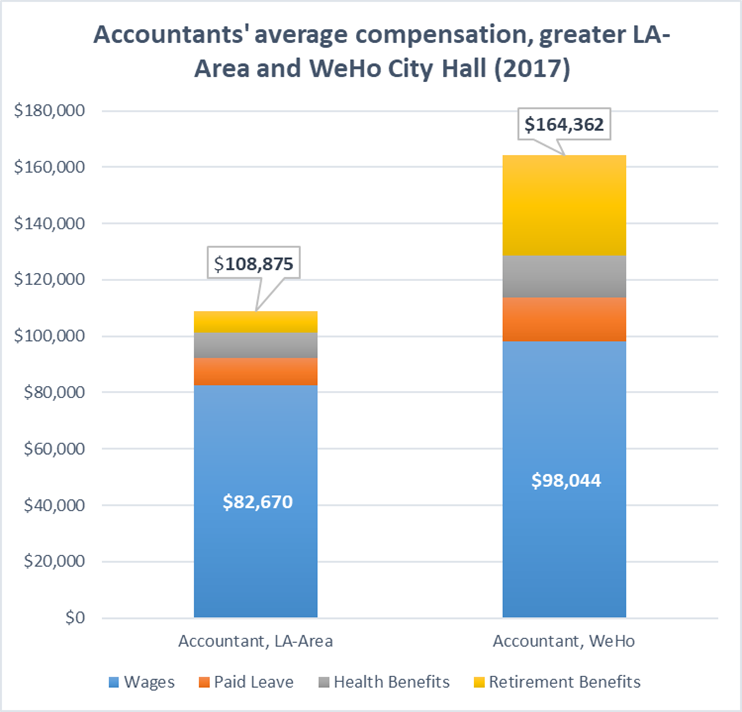 In addition to receiving wages that are significantly above the market average, West Hollywood city workers also receive benefits that are dramatically greater than what the average private-sector worker receives. For example, while the average private-sector worker receives a combined 30 days worth of paid holiday, sick, vacation and personal leave annually,West Hollywood city workers receive 41.5 days of paid leave annually. Government workers also receive significantly greater levels of job security than private workers, which has previously estimated to be worth between 3-10% of wages. This analysis will omit that variable, which means the findings here understate the compensation premium received by WeHo city workers. 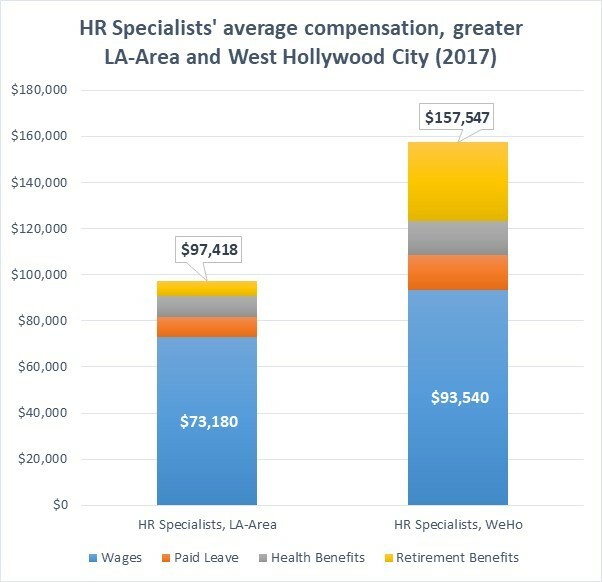 Employer-paid health benefits for WeHo city government workers are about 50 percent richer than what the average private-sector worker receives,while retirement benefits are many multiples greater, and can as much as 5 times richer than what a comparable private-sector worker receives. Wages and benefits for WeHo city government workers are significantly above market levels. The City Council’s desire to further inflate that gap — at the expense of city residents who earn far less themselves — cannot be attributed to a legitimate public policy interest. Instead, it appears likely that the council is simply using other people’s money to curry favor with the government union or otherwise signal their progressive bona fides. Yet, there is little that is genuinely progressive about taking from those with less in order to give to those with more. One of the most compelling arguments for limiting the size and scope of government is the recognition that elected officials are actually rewarded for furthering the inequity described above. This is because the cost can be spread over many taxpayers — who might only have to pay an extra $100 or so in annual taxes — while the benefits are bestowed on a concentrated minority. It’s easy to see why the much smaller group — which receives compensation packages around 50% above market levels — would be much more politically invested than the much larger, dispersed group who may never even realize why their taxes are going up. Add government unions to the mix, and you get a scenario exactly like what is playing out all across California today: lawmakers raising taxes on those earning less, just so they can further inflate government pay packages that are already well above market levels. Specifically, the Los Angeles-Long Beach-Anaheim metropolitan area. Average wages reflect full-time, year-round workers. The value of WeHo city workers’ retirement benefits were calculated using the method employed by the Congressional Budget Office, as explained here, and will thus differ slightly from the actual cost.